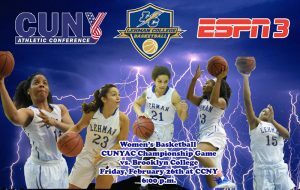 The Lehman College women’s basketball team is back in the CUNYAC Finals for the first time since 2011. The Lightning earned a spot in the championship game by defeating CCNY 84-79 on Wednesday night. The Lightning, the No. 1 seed after winning the regular season title, will face the Bulldogs of Brooklyn College, the No. 2, who beat CSI to punch their ticket into the finals. The teams will tip-off in Nat Holman Gymnasium on the campus of City College at 6:00 PM. The game will also be aired on ESPN3. Over the years, Lehman (19-7) has made eight trips to the finals, winning it all in 2007. At stake is the conference automatic qualifier into the NCAA Division III Tournament which tips-off next weekend. The Lightning used a 14-0 run late in the second quarter to separate themselves from CCNY. Then the team converted 34 of 42 free throws, a season high and CUNYAC Tournament Record, to power themselves to victory. Amley Del Rosario, the CUNYAC Player of the Year, led the way with 29 points including 17-19 from the charity stripe. She also added 10 rebounds and eight assists. Jennifer Navarro, the top three-point shooter in the country, scored 23 points. Karrin Walker posted her 12th double double of the season scoring 11 points while grabbing 12 rebounds. Amani Lightbourne and Yarmese Jones chipped in 15 and six points respectively. The Lightning and Bulldogs split the two contests they played against each other this year; each winning on the other’s court. Back in mid-December the Lightning squandered a 15 point halftime advantage to fall 54-45. However, they got their revenge in late January with a 74-59 victory at Brooklyn.